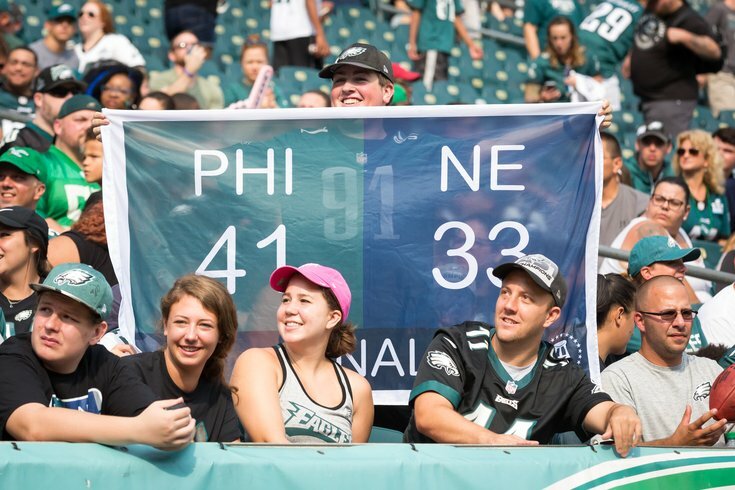 The Eagles kick off their Super Bowl defense on Thursday, which means the city of Philadelphia is starting to get back into the football spirit. On Tuesday, alt-rock dude Mac DeMarco performed at the Mann Center, and the crowd showed just how ready for football season the city is. In case you somehow forgot, Tom Brady plays quarterback for the New England Patriots. In early February, he dropped a pass in Super Bowl LII, a game the Eagles won, 41-33. The crowd was pretty clear in its evaluation of the future Hall of Famer, so DeMarco and his band did what they do best: They laid down a pretty smooth backing beat and let things ride. The Eagles face the Atlanta Falcons at Lincoln Financial Field on Thursday, while the Patriots kick off their season at home against the Houston Texans on Sunday. Football, and everything that comes with it, is back.